We all hate being out of tune. But those days are gone. Tuners are affordable and effective. So no more excuses. The Snark SN5X is affordable and powerful, you won’t be disappointed. Is there anything more annoying than an out of tune guitar? Ok, maybe there is….but it’s right up there when it comes to annoying sounds, right? An out of tune guitar can make even the best guitarist sound average. Turning your crisp clean playing into a sickly and ugly tone. When I learned to play guitar, tuning was done by ear. I was pretty good at getting all the strings in tune with each other, using that simple method of fretting the 5th frets (4th fret for the B string). Of course, this all hinged on whether the low E string was actually in tune. I remember going to jams with friends, my guitar nicely in tune, only to find out that I was basically tuned a half step down or up, compared to the other guys. Fast forward 20 years and tuning is a snap of the fingers. Fast forward 20 years and tuning is a snap of the fingers. Tuning pedals let you tune up while you’re playing, and are a standard part of any professional pedal board. Of course, if you play acoustic, that doesn’t help. Clip-on tuners, when introduced about 10 years ago, possibly the best investment you could make in guitar. For as little as a set of strings, you can have a battery powered, portable tuner that will work on guitar, bass and even violin. 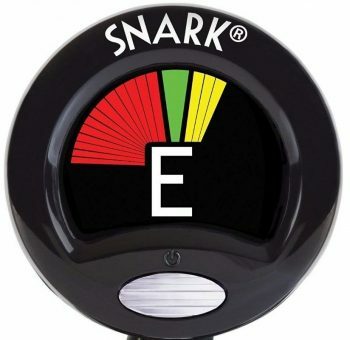 Snark have made their name as producing among the best clip on tuners. They’re distinctive, light and powerful – working on many stringed instruments. The general premise of a clip-on tuner is that they clip on to the head stock, then as you pluck a string, the tuner picks up the vibration and matches it to the frequency. Given string frequencies are known, it can then tell you which string you’re playing and how far off perfect tuning you are. The screen will guide you through getting into tune. Another advantage with this type of tuner is that whilst some tuners work using a microphone, others plug into the guitar , the Snark SN5X is a chromatic tuner, so it uses vibrations. The advantage is that you don’t have to be quiet to tune up – you can tune with noise around you. The vibrations go through the body of the guitar and are detected by the tuner. The high definition display makes it easy to read the tuning guide. 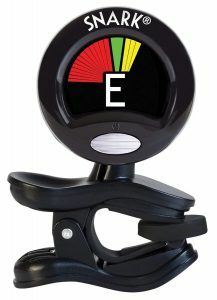 A 360 degree swivel head means you can angle the tuner to face you, regardless where you clip it on. The Snark SN5X is a neat little unit, easy to use and I found the screen to be really clear and bright. Simply, pluck a string, and then follow the guide to adjust tuning to perfect pitch. The unit is made of plastic, but the design is nice and it doesn’t feel cheap. 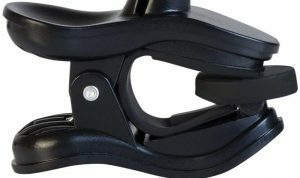 The padding on the clip means you won’t damage the instrument, which is a concern for some. If you’re the type of player who wants to experiment with tunings other than standard, you’ll need to look at the SN-8 model. 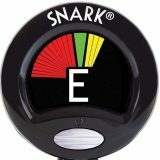 Snark’s range of tuners can be across many instruments, here’s a guide if you’re after something very specific. The Snark SN5X is simple, affordable and a powerful little clip on tuner. As far as other clip-on tuners, you can pay more, though I doubt you’re going to get better results than with the Snark. It’s money well spent! As I said in the outset, you’re unlikely to get more value for money than what you’ll pay for a tuner.